Discovered By: It was first seen on an island in the middle of the ocean, by an Outcast named of Elyas the Wicked. Males: From head to tail tip= approx. 12 feet. From front paws to top of head= approx. 8 feet. Females: Head to tail tip= approx. 10 feet. From front paws to the top of their head=approx. 6 1/2 feet. Scale Color and Description: Their main scale color is generally a light purple, but they can be dark blue or light red as well. Their scales aren't extremely strong, and can be pierced easily. Other: Atop their head sits a set of two horns, two on either side. Their ears are long and thin, sprouting from beside their horns. Along their forehead and down the neck rests a majestic mane of colors. Their wings are long, and they have hooked talons on the top of them. The skin connecting the wing bones is usually white, but can be light purple or pale red. Down the top of their tail is another mane of colors, and this strange hair is also sprouting from the back of the arms and the bottom of the chest-typically in males only. The end of their tail is shaped like three petals of a flower, and their claws are long, sharp and strong. For anything else see picture. Approximate Weight: Baby= approx. 40 lbs. Juvenile= can range from 70 lbs to 100. Approximate Size: Head to tail tip= approx. 5 feet. From front paws to the top of their head=approx. 3 feet. Scale Color and Description: A darker color than their parents. They can also be dark blue and light red. Some of them have strange markings on their muzzle, tail, wings and legs. Build: They are usually thin and slim, few showing much muscle. Other: The young Diamond Glades always have a darker scale tone than the adults, whatever the color. They have very small horns growing like stubs from their forehead, and the colorful crest is only just beginning to grow. New borns don't have it at all. Their claws tend to be short and usually not very sharp. The juveniles tend not to have arm fur until later on, and their tail is much shorter than the adults. Their eyes also tend to be much wider and brighter than the adults. Likes: The Diamond Glades tend to prefer fish for food, but also enjoy the smell of fireweed. Weaknesses: The weakness of their underbelly as it has no strong scales. And their papery thin wings, they can be torn easily. Other: Diamond Glades generally peaceful creatures. They roam through the forests in solitude. They are rarely found in groups, though they can be seen in pairs while a female is impregnated. They have very protective natures, despite being solitary creatures, and never leave something/one to die. Of course, this doesn't apply to any prey they may eat. This dragon has a very keen sense of smell, and will alert other creatures around them with a high pitched screech if something is wrong. If they find an animal being attacked they will protect it, as they aren't very fond of bullies or gangs. Diamond Glades rarely go into large, open spaces such as moors as they don't like the wind. They generally stay in forested areas, sometimes the lower parts of mountains. They make their dens in hollowed out oak trees, and sometimes caves. They sleep for long hours, and they make very good detectives due to their noses. They are very good at staying hidden. Attacks: The Diamond Glade has incredibly long and sharp nails, that they can use to shred an enemy to bits. The can cut trees down with these talons, and dig up roots as well as boulders. Their foreheads are enforced by strong scales as well as the horns, which the can use to attack. Their tail can seem as though it has a mind of its own, and it can pick up objects for a short period of time. Their teeth are sharp and short, but they can bite through nearly any material. Despite their wings being very thin and papery, they are strong and can allow them to fly for a long time. They have strong muscles in their forearms, that can push an enemy away. They can't shoot fire, but they can pick water up through holes in their tail and spray it from their mouth-similar to an elephant. Special Abilities: It has pores in its tail that allow it to soak up liquids, generally water. Habitat: Diamond Glades are extremely rare. They're basically never seen, and even when they are it's just a glimpse of the tail, the wings, the mane. They're typically live in largely forested areas, preferring to stay near largely grown oaks or a grove of pines. 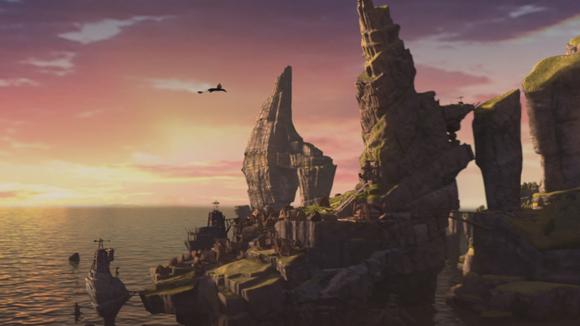 None have been sighted on Berk thus far, but there have been sightings on Outcast Island and on random islands in the Ocean.